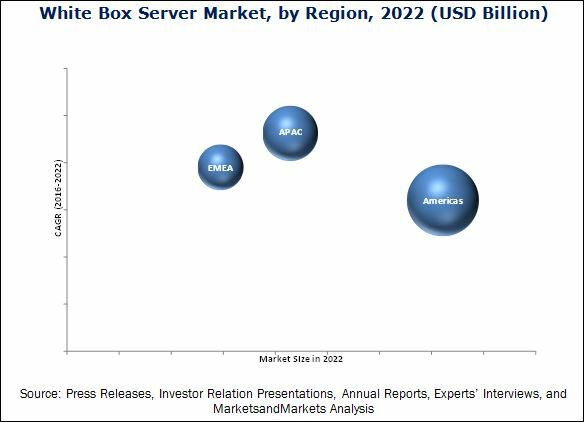 [147 Pages Report] The white box server market was valued at USD 4.59 billion in 2015 and is expected to reach USD 14.43 billion by 2022, growing at a CAGR of 18.6% between 2016 and 2022. A white box server is a data center computer which is not manufactured by a well-known vendor. It can be found in large data centers run by giant Internet companies such as Google (U.S.) and Facebook Inc. (U.S.). White box servers are usually purchased in bulk quantities from original design manufacturers (ODMs). ODMs generally build their servers with commercial off-the-shelf (COTS) components that can be assembled in different ways or upgraded to provide the customer with a degree of system customization. The base year considered for study is 2015, and the forecast period is between 2016 and 2022. This report provides a detailed analysis of the white box server market based on form factor, business type, processor, operating system, and geography. Report forecasts the market size, in terms of value, and main regions: the Americas, Europe, the Middle East & Africa (EMEA), and Asia-Pacific (APAC). It strategically profiles the key players and comprehensively analyzes their market rankings and core competencies, along with the detailed competitive landscape for the market leaders. The white box server ecosystem comprises material and component providers, ODMs, end users such as data centers and enterprise customers. The players involved in the white box server market include Quanta Computer Inc. (Taiwan), Wistron Corporation (Taiwan), Inventec Corporation (Taiwan), Hon Hai Precision Industry Company Ltd. (Taiwan), MiTAC Holdings Corp. (Taiwan), Celestica Inc. (Canada), Compal Electronics (Taiwan), Hyve Solutions (U.S.), Penguin Computing (U.S.), Servers Direct (U.S.), Stack Velocity Group (U.S.), Super Micro Computer Inc. (U.S.), Silicon Mechanics (U.S.), and ZT Systems (U.S.). In April 2016, Google Inc. (U.S.) and Rackspace Inc. (U.S.) designed a server based on IBM Corp.’s (U.S.) upcoming Power9 processor. This research report categorizes the global white box server market on the basis of form factor, business type, processor, operating system, and geography. White box servers are the servers which are directly sold by ODMs or EMS providers rather than OEMs. White box servers are usually purchased in bulk quantities from suppliers called as original design manufacturers (ODMs). ODMs usually build their servers with commercial off-the-shelf (COTS) components that can be assembled in slightly different ways or upgraded to deliver the customer with a degree of system customization. White box server market has been segmented, on the basis of business type into data centers and enetrprise customers. Data center is expected to dominate the white box server market druing the forecast period. Hyperscale data center operators such as Google Inc. (U.S.), Microsoft Corp. (U.S.), Amazon Web Services, Inc. (U.S.), and Facebook Inc. (U.S.) prefer to build servers directly from ODMs rather than OEMs due to low-cost of manufacturing with the same quality provided by OEMs and a high degree of customization, which is fuelling the growth of the white box server market. Projects such as OCP, Project Scorpio, and OpenPOWER Foundation are motivating the giant players to build their own servers. Major clients for ODMs include Facebook Inc. (U.S.), Microsoft Corp. (U.S.), Rackspace Inc. (U.S.), Google Inc. (U.S.), Amazon Web Services, Inc. (U.S.), Alibaba Group Holding Ltd. (China), Baidu Inc. (China), Tecent Holdings Ltd. (China). Different types of servers based on form factors include tower servers, rack servers, blade servers, and density-optimized servers. Tower servers look most likely PCs. Each tower server is a standalone machine that is built into an upright case. In this type of tower servers, the data is stored in a single tower rather than being spread across various machines. It is relatively compact. One advantage of the tower server includes easier cooling because the overall component density is fairly low. Tower servers are used mostly in smaller data centers. Its simplicity and robustness also mean that the tower server is considered to be an ideal for small companies. It does not require robust maintenance. Rack servers are servers that are mounted in a rack. The rack is of a uniform width and servers are mounted to the rack using screws. Each rack can accommodate multiple servers, and the servers are typically stacked on top of each other which makes cooling more difficult, while scaling is much easier. A rack server is designed to be positioned in a bay, which assists one to stack various devices on top of each other in a large tower. The bay would accommodate all of the hardware devices the company needs to function, including the server, storage devices, and security and network appliances. A blade server is basically a stripped-down version of a standard rack-mounted server unit that contains just the bare essentials: a CPU, RAM, integrated I/O ports, and network adapters. Other components, such as power converters, cooling equipment, and storage are provided by the blade server chassis, which itself fits into a standard rack enclosure. This makes blade servers even thinner and also more expensive. Modular and dense server form factors were originally introduced to address the data center floor space and power/cooling costs of hyperscale data centers. Density-optimized servers are addressing an increasing number of web and HPC workloads for customers that require a balance of OPEX (power, space) with overall system throughput. Rack & tower servers are expected to grow at the fastest rate during the forecast period due to the increasing adoption of rack servers in both data centers and enterprise customers while tower servers in enterprise customers. The market for non-X86 servers expected to grow at the fastest rate during forecast period due to more power-efficient feature; ARM processors are being preferred by data center operators and an ARM server is getting much support in the server market. The market for Linux servers expected to grow at a significant rate in coming years. More stability, scalability, cost efficiency offer greater adoption of Linux servers among end users. APAC is expected to be the fastest-growing market for the white box servers during the forecast period due to the increasing presence of cloud service providers in APAC. There are number of reasons behind the growth of Asia-Pacific data center industry such as increasing number of internet users, increasing need for an infrastructure refresh in older data centers, growing role of data sovereignty as data privacy laws mature in Southeast Asia. Hong Kong and Singapore, being strategic locations for the white box server market, presence of giant players such as Alibaba Group Holding Ltd. (China), Tecent Holdings Ltd. (China), Baidu Inc. (China) which play an important role in the white box server market. Also, players such as Facebook Inc. (U.S), Microsoft Corp. (U.S.), Amazon Web Services Inc. (U.S.), and Google Inc. (U.S.), among many others are increasing their presence in the APAC market. Moreover, many cloud service providers inclined toward the adoption of white box servers over branded servers. Large enterprises in APAC also expected to adopt white box servers in the coming years. 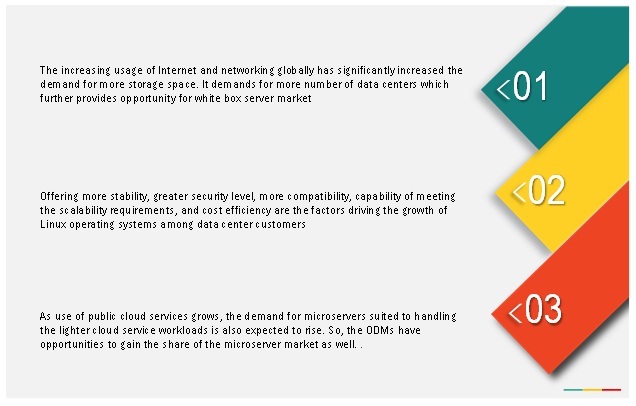 What are the growth opportunities in white box server market? ODMs' limited service and support capabilities and lack of channel partner engagement affect enterprise business restraining the growth of the market. Currently, ODMs have maximum contribution to the hyperscale data center segment which constitutes giant data center operators such as Google Inc. (U.S.), Facebook Inc. (U.S.), Microsoft Corp. (U.S.) Amazon Web Services, Inc. (U.S.), Baidu Inc., (China), Alibaba Group Holding Ltd. (China), and Tencent Holdings Ltd. (China) among others. ODMs still don’t have any hold on to enterprise customers; this is mainly due limited service and support capabilities of ODMs. OEMs offer better maintenance or after-sales services than ODMs. Top server vendors (OEMs), such as Hewlett-Packard Co. (U.S.) and IBM Corp. (U.S.), have built their businesses around making advanced support technicians available all time. The major players in the white box server market include Quanta Computer Inc. (Taiwan), Wistron Corporation (Taiwan), Inventec Corporation (Taiwan), Hon Hai Precision Industry Company Ltd. (Taiwan), MiTAC Holdings Corp. (Taiwan), Celestica Inc. (Canada), Compal Electronics (Taiwan), Hyve Solutions (U.S.), Penguin Computing (U.S.), Servers Direct (U.S.), Stack Velocity Group (U.S.), Super Micro Computer Inc. (U.S.), Silicon Mechanics (U.S.), ZT Systems (U.S.), and so on.